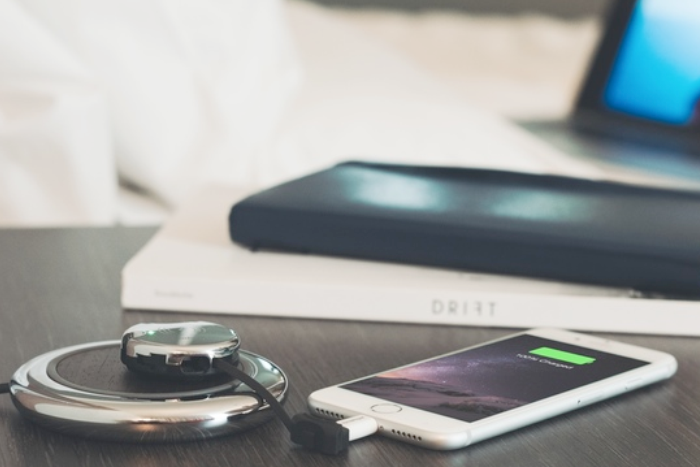 Keeping your devices charges whilst away from home is a continued nightmare. After dragging around a bulking power adapter, you struggle to find a power outlet. This is where a brand new Kickstarter campaign steps in. Aircharge is looking to secure £20,000 with backers providing over £13,000 already. The Aircharge keyring is a small attachment for your keychain that contains both a Micro USB and Lightning connector that will allow you to wireless charge your device on any compatible Qi wireless enabled charger. The keyring attachment is a little bigger than a £2 coin, but both adaptors tuck neatly away within the keyring. With support for iPhones, Android devices and any number of Micro USB devices such as tablets, headsets, cameras and portable power packs. You simply unwrap the short cable from the keyring, select the adaptor of choice, plug it in to the device that needs charging and place the keychain on the charger, it is ridiculously simple. The keychain feels solid to hold is available in either Black or Silver. Both colour options are available to order from only £20 on the Kickstarter page. As an added bonus, any pledge over £1 secures an entry in to a prize draw with a chance to win an iPhone 7. Aircharge claim to be the first to market with a dual Micro USB and Lightning connector capability and have been developing the keyring for over a year securing Apples MFi Certification. 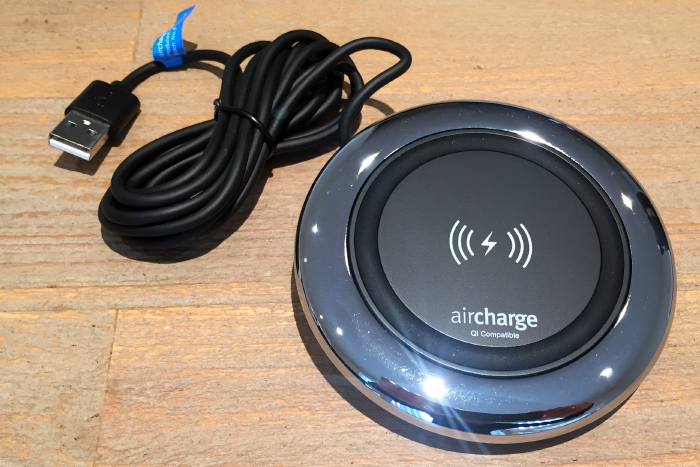 When out and about, Aircharge have developed an app that directs you to your nearest wireless charger. 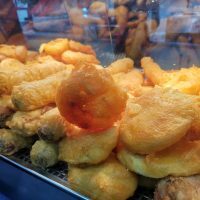 With over 4,000 already deployed in restaurants, cafes, shops, train stations, airports, hotels and even gyms, wireless charing pads are becoming increasing available. For example, Aircharge have recently secured a partnership deal with Novotel Hotels in addition to McDonald’s, Costa Coffee, Yo! Sushi, Eurostar, Virgin Trains, Virgin Active Health Clubs, Virgin Clubhouse, Emirates, Finnair, EE, Vodafone, Orange, O2, Hub by Premier Inn and IBIS. The list continues to grow. 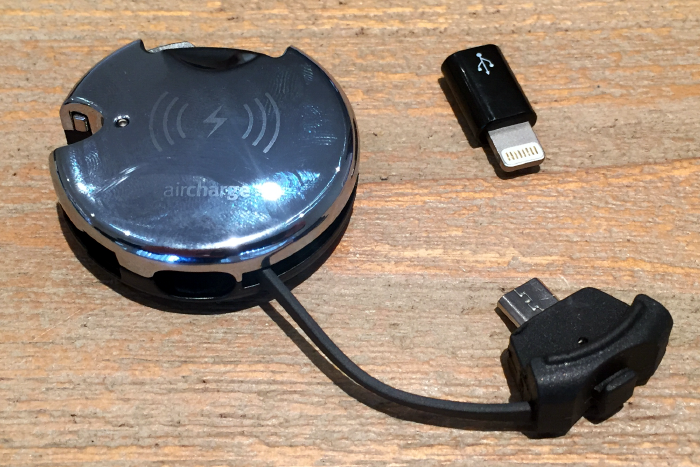 Aircharge also provide a Travel Pad or an Executive Wireless Surface Charger enabling you to utilise the keyring at home. Starting at £45 on their Kickstart page, the Executive Wireless Surface charger is finished in chrome look and feels extremely well made. It’s nicely weighted ensuring it wont slide around when placed. You’ll need to supply your own USB plug if you wish to use the inbuilt USB cable via mains power, however, you can plug it in to a computer if thats easier. As soon as you placed the attached keyring to the Wireless Charging Surface, charging begins instantly. Whilst your device is charging, you’ll still be able to use your device, although the cable is a little short down to the size of the compact keyring. As Apple don’t natively support Wireless Charging, one of the additional accessories you can purchase from Aircharge iPhone’s is the Wireless Charging Case removing the need for the keyring. Desktop lamps and valet trays with Wireless Charging are also available if you wish to go fully wireless. You don’t have long left to secure your Wireless Charging keyring as the Kickstarter campaign ends on Saturday the 10th December. Delivery should be in time for Christmas.